How does the online booking system works? The booking is recorded in your app. Our system will give to the customer the reservation number. You’ll see the new online booking through View > Online booking menu option. All these online bookings are recorded in your app but not yet confirmed. You have to review the information, check availability and then confirm the online booking into a real reservation. The app will allow you to send an email to the customer with the confirmation message. This way our system allows you to not automatically reject a reservation in your hotel just because there isn't enough space. Let's see an example. Any online booking will be automatically rejected, simply because you do not have availability for that date. Imagine that a reservation is automatically rejected from 1 to 30 September, simply because on day 1, the room is occupied. You decide if you cancel it or manage the space of your residence to be able to accommodate that animal. 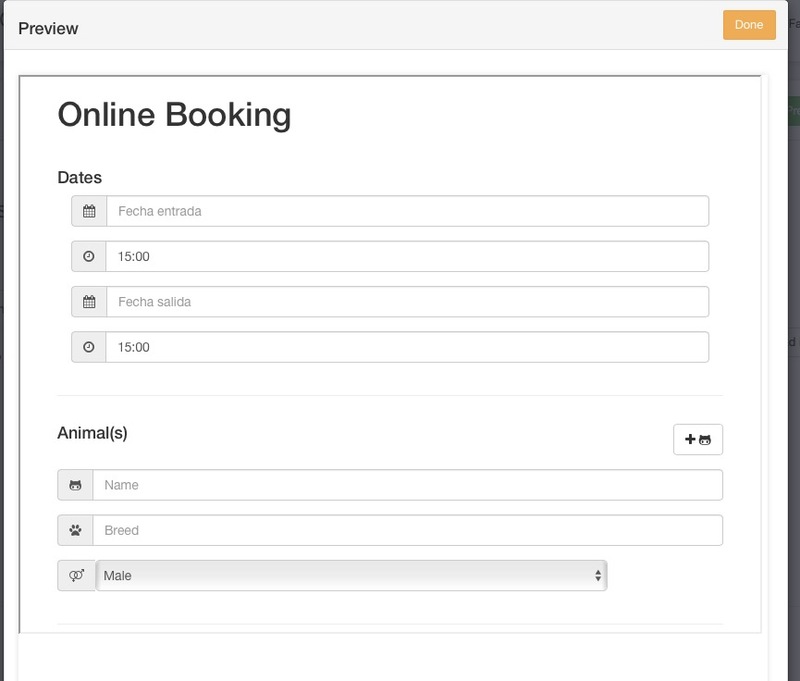 Edit what you need and confirm the booking to the customer by email automatically, just clicking a button. Simple and easy. It is a powerful system because it can be included in any part of the management process of your business That is, if you want to ask for more information to the client before confirming the booking, you can do it. If after confirming it, you usually send the client more information about the conditions of stay, information to make a booking payment (or a Paypal payment button, for example), or anything else, you can do it. Proceed as you consider and interact with the client as much as you need. If the customer has an invoice pending payment, an alert box with the information will be displayed. Thus, before making a booking, you will know if the customer has pending payments. It is very simple, if you want, you can configure the redirect page of the form, that is, the destination page (the page that will show the user after the customer press the "Request booking/appointment" button). Just write the "Redirect page" and click on the Save button. Thus, you can show the user a page with more information about the conditions of service, a page with payment information, a shopping cart, another section of your website, or wherever you want. If you do not write a page, will not redirect the user to any page, he will remain in it. The user must accept your conditions before requesting the reservation, and this acceptance "or signature" of the conditions is recorded in your customer file and you can consult it whenever you want. The user can also select if he wants to receive notifications from you by email. 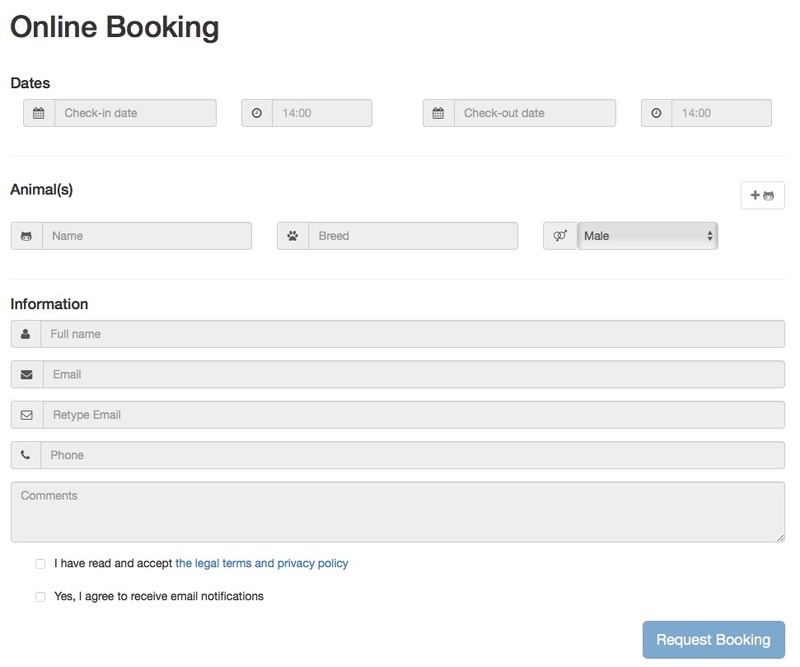 The booking request system does not include payment options, because until the moment you confirm the booking, it is only a request from the customer; But if you want, you can include after the process, payment options or show more information to the customer. As we have mentioned before, you can configure the page you want to redirect the customer after he fill in the form. If the owner brings the animal to the hotel -> A map, contact details and the time of check-in /check-out. If we collect it at home -> information about the collection service, time, etc. Access to any restricted area of our website, if we have it: customer area, access to the webcam if we have a monitoring service. Simply, we can take back to the booking page or show it the home page,etc. How to include it in your web? Paste this code into your web page. On your website, where you have pasted it (for example at the bottom of the page) now a button will appear and when the customer clicks on the button, a pop-up window will pop up with the form to enter the data and request the booking. Note:the button and the form have the language you have selected. Paste the button code in the code of your website, following the steps above. This code is an example. You must paste the URL that appears to you, if you hit this, it will not work. How to include it in your Wordpress? 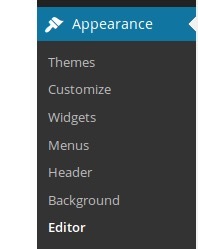 Wordpress does not correctly interpret scripts simply by pasting them into an entry or post. 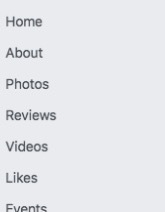 note: It will appear in the place where you hit it, if you paste it at the bottom of the page, it will appear in the footer and if you do it in the side menu, it will appear in that area. If you do not know how to do this, contact your webmaster to insert it in the part of the web that you want. 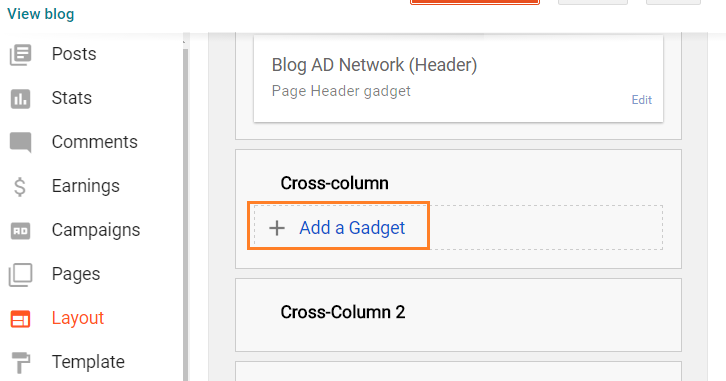 How to include it in your Blogger? It is already available and will appear in the place where you have placed it.